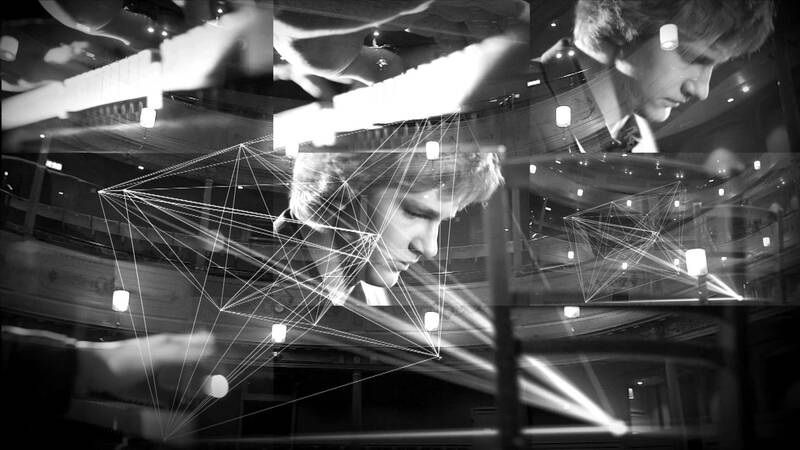 A collaboration between Sacconi Quartet and UWE Filmmaking to create a cinematic setting for a live performance of Beethoven’s Opus 132. Looking back on the experience, I am delighted with what we achieved in such a short time. It was a privilege to work with such wonderful musicians, Jonathan James was a delight, as was everyone at the Old Vic, and my partners on the film and vj-ing front did really well. By the end of it we had quite a team from UWE and beyond: Michael Sides, James Gates, Sean Gulliford, Rob Jewitt, Joe Haines, Jack Offard, Rob Gordon and Gustavo Barbaroso. Thanks to all. I hope we can work together again and experiment some more. In terms of how to judge it’s success, my view is that it was never going to be to everyone’s taste, given the already intimate nature of the space and intensity of the music itself. My judgement is also that for those already sitting up close and personal to the musicians, the visuals were on balance a distraction. I feel that this issue of seating and placement of screens would need further thought in any future experiments. However, for those like me standing or sitting even a short distance away, I feel that the visuals did help to increase the intensity of the performance for those who were willing to go with them even if they were not essential to its integrity. I also wondered at one point whether we needed the roving cameras at all and was aware that the physical size and presence of the cameras was quite imposing. I did, however, appreciate the layering of imagery that we achieved and wonder how it would have felt with less intrusive technology. I would also have loved to work with a professional lighting designer to further experiment with immersive effects. 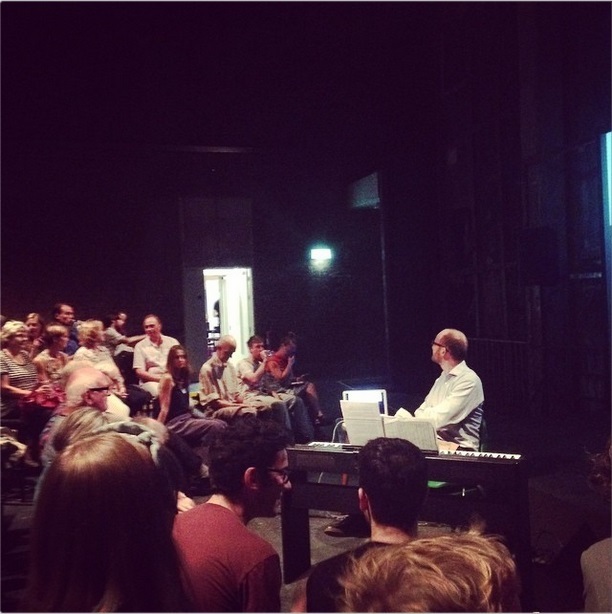 Overall, I am confident that what we achieved, as a unified approach across Jonathan James’ talk and the performance itself, did move people and offer new ways into Beethoven’s music. 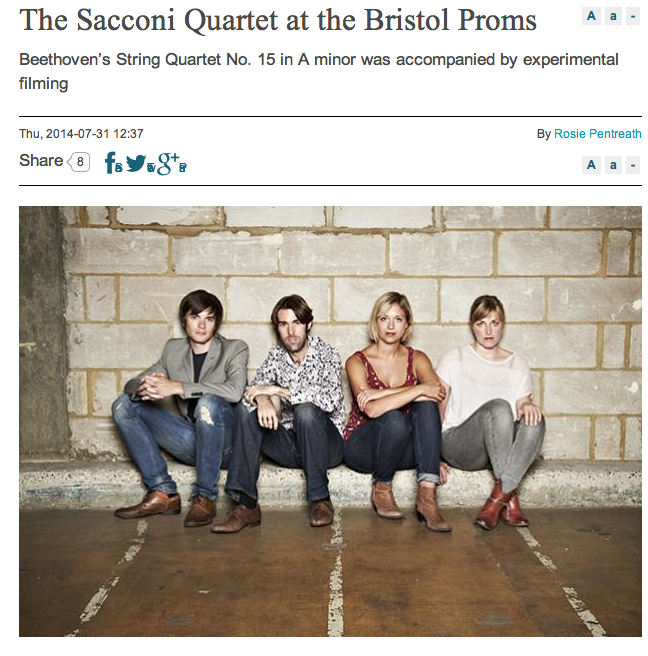 I also hope that it has helped to bring new audiences to the Sacconi Quartet’s wider repertoire. Thank you to Universal Music and the Bristol Old Vic for enabling it to happen. 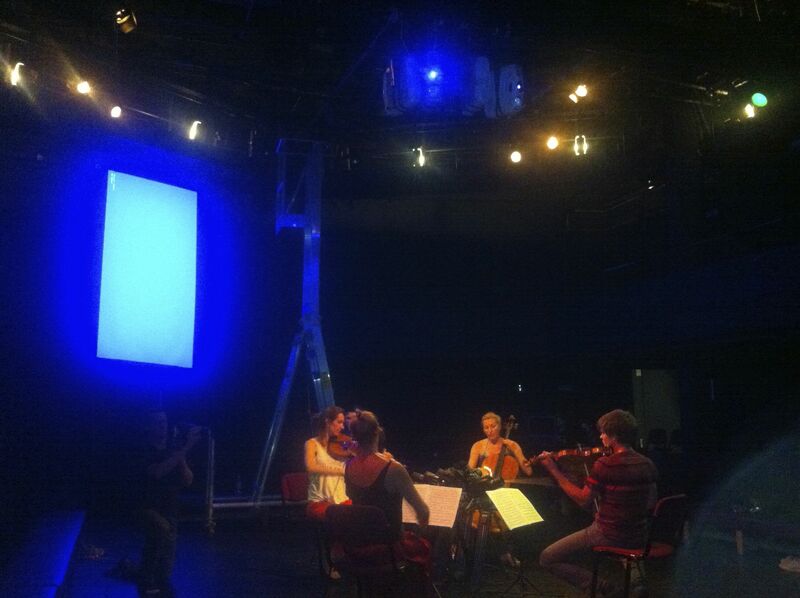 It was very hot in the Studio and the Quartet did well to play so beautifully. Not only that but their professionalism was manifest in the way that they seemed so un-phased by the cameras, even though it was a totally new experience for them. 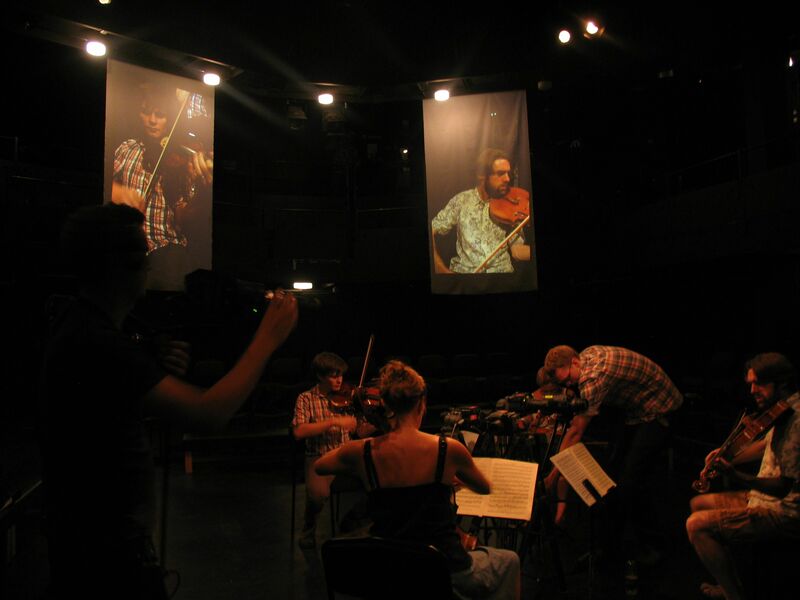 We had specifically placed the projections behind each musician so that no-one would be distracted by a large scale images of him or herself but they must have been highly aware of the two roving cameraman. Whilst their playing in our rehearsals had been wonderful, the extra mile that they went for the performance itself was extraordinary and I was deeply impressed. 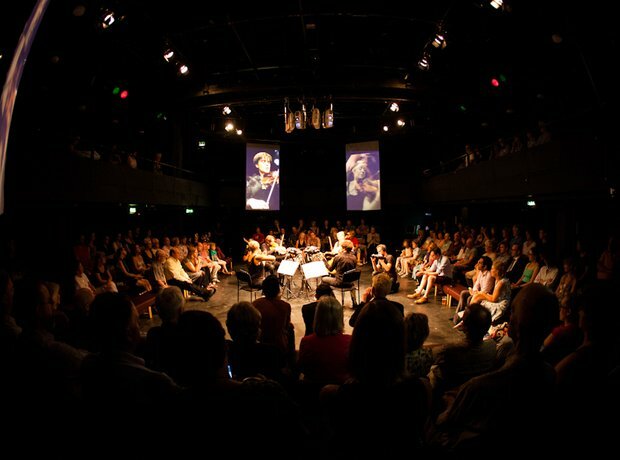 During the performance, I stood downstairs at the back, whilst in the rehearsals I had moved around to experience the playing from different perspectives. Everything worked in terms of the tech and I was really pleased with the lighting. Whilst there were moments when the cameramen were a bit noisy, particularly when they came on, I was delighted with the shots that they achieved and with the live mixing from our VJs to layer these close-ups over the static mid-shots. I also felt very strongly that we had made the right decision to simplify the visual intervention in the third movement. As part of the Proms, Jonathan James delivered a series of ‘inside the music’ talks. One of them was before our performance, the aim being to shed light on the visionary nature of Beethoven’s String Quartets. This was a great opportunity to talk about the narrative within the music and to help new audience members to find a point of connection with the music. My nine year old son was at the talk and was totally entranced by the enthusiasm and clarity of his delivery. As documented by Prombassador Guy Withers. Our aim was to create an immersive ‘in the round’ atmosphere to place the audience ‘inside’ the music and accompanying projections. 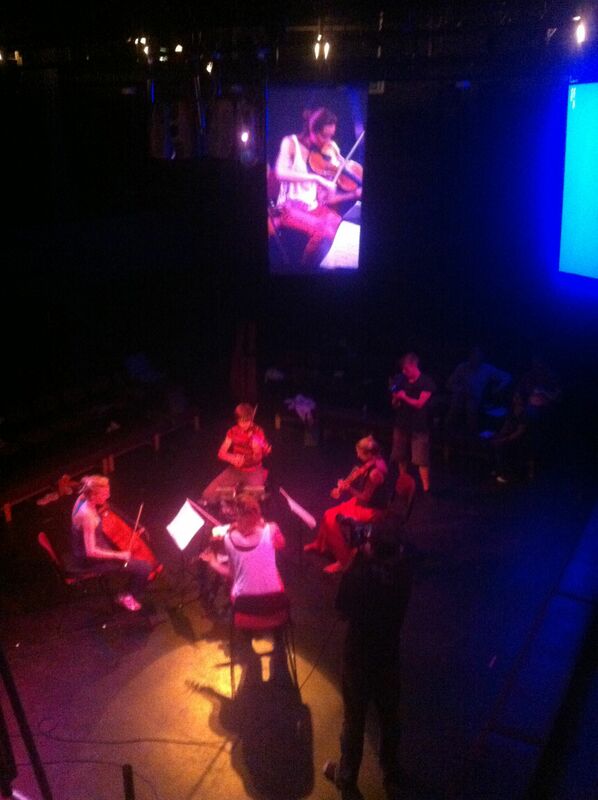 We hung drapes over the balcony in the four corners and set up a static camera feed on each musician. We then had two roving cameramen filming closeups for our vision mixers to layer on top of the static shots. We made the additional decision not to have the roving cameramen in the third movement, to simplify the visual treatment and encourage the audience to focus in on the music. The static camera feeds were set-up to provide full profile shots, as I felt that they gave the best view of the musicians playing their instruments. However, the framing didn’t work in the space and we ended-up going in closer. Although this felt a little too intrusive for me, it was necessary to achieve our Caravaggio style aesthetic of the musicians framed against an unbroken dark background. The only irritating exception that broke that ‘magic’ was the intermittent appearance of a green exit sign behind the viola player’s head! I established contact with Jonathan James, while he was still planning his accompanying talk on Beethoven’s visionary quartets. I invited him to our initial workshop with the Quartet and involved him in the development process. This enabled us to consider the narrative behind and within the music, and to think through appropriate ways for the visual elements to reinforce it. Jonathan was invaluable in helping us to experiment with the lighting states, as a means of reflecting the different moods within this narrative. Opus 132 can be seen as offering an allegory for ill health and the battle for recovery, reflecting what was happening to Beethoven at the time of writing it. With the long third movement reflecting his realisation that he was getting better and his praise to God for his recovery, we wanted to allow the audience to focus in on the music with minimal distraction from the visuals. One of our strategies to help achieve this was to experiment with bringing the lighting down at this point in the music to create an intimate ‘candle-lit’ ambience. This I feel was a very effective approach to be taking. The final preparations and run-up to the live performance was all a bit of a scramble and then I went on holiday, so this is being written in retrospect. I will, however, report on events as they unfurled to keep a clear narrative line. It took longer than anticipated to get all four screens working but we got there in the end. We had to hire an additional vision mixer and a signal booster before we could calibrate the projectors. I never want to see an HDMI connector again! Another essential day in the Studio, this time with the Quartet. Projectors have been rigged, our screens are up and we’ve cued the lights. We still haven’t got all of our screens working, due to cabling and compatibility issues, but I’m loving the shadows that we’re getting from the spotlights. The projections look great on the drapes and the live layering of closeups onto wider shots of the musicians playing through vision mixers is really effective. We have more rehearsal time tomorrow afternoon to test out the different camera angles. Hopefully the tech issues will be sorted by then. Great news today – our Prom is listed as being sold out! So, three nights at Colston Hall sold out with the Russian Winter and now this. How very pleasing. Musn’t get too used to it though, as I know how hard it can be to get people through the doors and you are only as good as your last show. Big mystery now is who is the audience? At last year’s Sacconi Prom, attendees were notably older and more traditional than for the other Proms. Public perception of Quartet playing is that it is old fashioned and stuffy but the Sacconi’s are not at all like that. It is our hope that our cinematic setting with vj-ing will help to attract some younger audience members. Michael Sides and I saw last year’s ‘from every angle’ Prom with Jan Lisieki. We experienced lag, as we were in the audience at the Watershed watching a live feed from the Old Vic theatre. The general view is that it was the lag or delay that made this experience somewhat unsatisfactory. Whilst this was indeed an issue, as the event was predicated on live relay, I also found the simultaneous overplay of so many multiple screens and camera angles distancing. For me, the visuals were too busy and the camera angles often failed to enhance the intimacy the performance. That said, my favourite part was when we saw a bead of sweat fall of Jan’s nose – as this made me feel more involved with the emotions behind his performance. I was also moved by the juxtaposition of his hands and feet as he was playing. One way around lag is to keep it to a minimum, the other is to play to it through the explicit use of slow motion. Both are valid approaches, the former being more theatrical and the latter more cinematic. Which art form is calling the shots in our project with the Sacconi Quartet? This question needs to be asked. As a multimedia person with a longstanding interest in the power of juxtaposition to reveal new ‘truths’, I favour the latter – or would at least like to try it out. Unfortunately, we are not able to do that because we don’t have the equipment or hire budget to do this with a live feed. No matter – all projects need limitations to push their creativity. I shall save this particular set of ideas for another time….For now, our priority is to keep things simple and to pay close attention to the music in the design of the visual treatment. 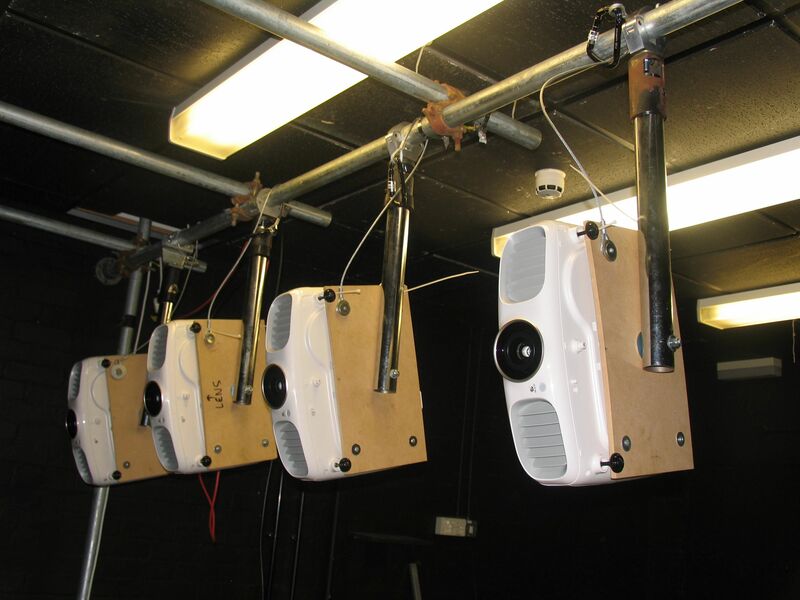 Last week’s tech tests revealed that we needed to think carefully about where to position the projectors to maximise the sense of immersion and to prevent ‘keystoning’. This is distortion caused by projecting an image onto a surface at an angle. It will also affect how and where we can hang our drapes. In order to project a portrait as opposed to landscape image, we need to place the projectors on their side. 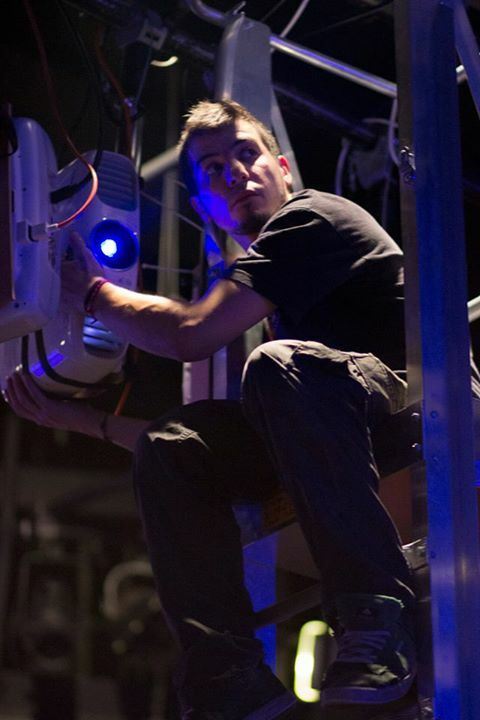 This led to us building stands for the projectors to create a flexible rigging system. As a ‘practice-led academic’ who is constantly moving between analytical and intuitive processes, I’m loving the hands-on practical problem solving.